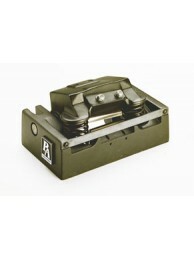 These units chop a wide variety of materials from paper to cold rolled steel without adjustment. Once installed, any number of stock thicknesses can be fed into the chopper without any additional set-up time. The reel-type scissor action reduces off-center loading by chopping a width of only 14 times the maximum material thickness at one time regardless of total stock width. Helical-ground blade which chops wide variety of materials from .004"-.1875" CRS without adjustment. SC-6 SCRAP CHOPPER This unit chops a wide variety of materials from paper to cold rolled steel wi..
SC-9 SCRAP CHOPPER This unit chops a wide variety of materials from paper to cold rolled steel wi..
SC-12 SCRAP CHOPPER This unit chops a wide variety of materials from paper to cold rolled steel w..